Christmas only comes around once a year, but when it does it can bring with it a financial hangover that seems to last for months. It’s easy to get caught up in consumerism at Christmas, looking to surprise people with the best gifts, being drawn in by bright and jolly storefronts and generally trying to outdo the year before. Make a deal with friends and family members to only spend within a certain budget. You might also want to consider getting all the adults in the family together and organising a Secret Santa style gift exchange, so everybody’s cost is reduced to just one gift. Don’t be tempted to overspend just because you’ve got a bargain! If you’ve managed to find an item for less than you budgeted, that doesn’t mean that you need to spend the difference on something else. Do most of your shopping in advance – but unless you have excellent willpower, don’t buy absolutely everything early. Most of us will inevitably get caught up in the excitement of the last few days before Christmas and decide to splurge on some treats… it’s better to let these be the last few things on your list than extras you didn’t need. 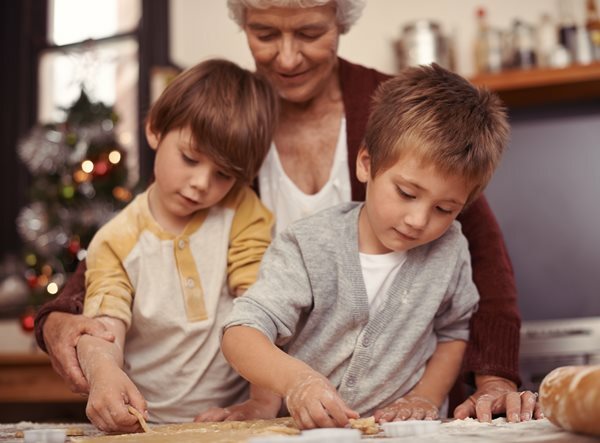 Help the Grandchildren send letters to Santa. If you send them to the address provided here, then they should receive a reply from Father Christmas – all for the cost of a stamp. If you’re hosting Christmas dinner, that doesn’t have to mean doing all the work! Ask guests to contribute dessert, nibbles or sides for your own festive pot luck. Think of gifts in terms of how much they’ll be appreciated rather than how much they cost to buy. This means you don’t have to go out of your way to spend equal amounts on each person: it’s just about giving each person something you think they’ll love. Hold an ‘eat what you’ve got’ week in early December. This means going through the cupboards and putting together a list of all the meals you can conjure up from the ingredients you have on hand – even if the combinations you come up with are a little odd! It might not be gourmet, but it will slash the cost of your weekly shop. Put the savings into your Christmas fund. Cash in your supermarket points. A lot of supermarkets do special deals around Christmas to help you get more from the loyalty points you’ve saved up throughout the year, so even if you haven’t got loads it’s a good time to cash in and get some money off the big dinner. Speaking of Christmas dinner, why not focus on one or two luxury items and buy the rest at a budget? Splash out a little on the things that your family really loves, but cut back on the filler foods – nobody will notice while they’re enjoying the one or two items that you did spend out on. Give children ‘make and do’ gifts that you can then share together as an experience. This can be significantly cheaper than buying a big ticket item, and might be as simple as measuring out the ingredients for brownies and presenting them in a decorated jar. These gifts help you to make memories with your loved ones, something that can be a lot more valuable than the latest designer clothes!